Wilson Miles Cary Fairfax, Plan of Harrisonburg, 1828. 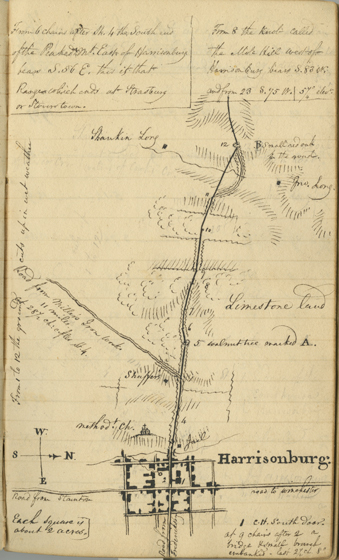 The first-known map of Harrisonburg appears in a surveyor’s book, tracing a possible route for an east-west turnpike across the Shenandoah Valley, from Richmond to Franklin, West Virginia (then a part of Virginia). 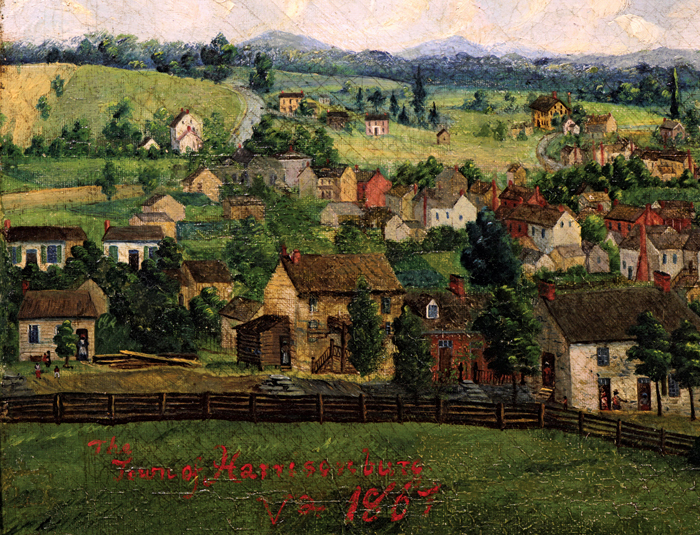 Emma Lyon Bryan, “Town of Harrisonburg, Va. 1867,” oil on canvas. Bryan’s famous panorama offers a detailed, idealized vision of Harrisonburg in the aftermath of the Civil War. Detail of Emma Lyon Bryan, “Town of Harrisonburg, Va. 1867.” By 1867, many African-American freedmen lived in this row of houses in the town’s “Jail Hill” neighborhood, which would later be leveled during the Urban Renewal era (see slide 10). 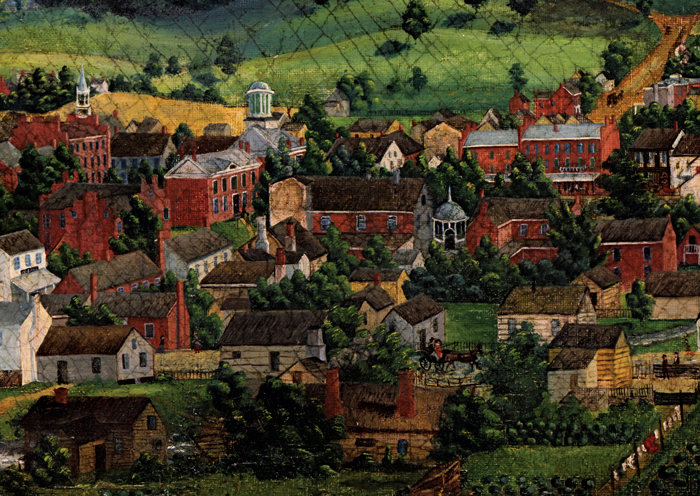 Detail of Emma Lyon Bryan, “Town of Harrisonburg, Va. 1867.” A view of Court Square, the commercial and administrative center of Harrisonburg and Rockingham County. “Bird’s Eye View, Harrisonburg, Virginia.,” ca. 1910, postcard. A turn-of- the-twentieth century double-postcard showcases the town’s new Rockingham County courthouse, designed by noted architect T. J. Collins, and the growing city center around Court Square. 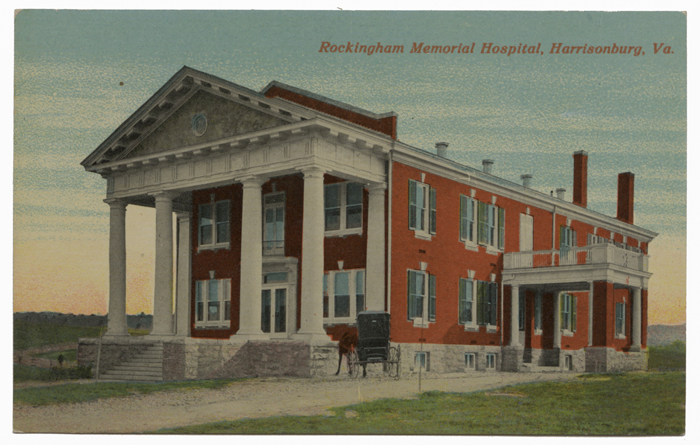 “Rockingham Memorial Hospital, Harrisonburg, Virginia.,” ca. 1910, postcard. Built on a hill southeast of downtown, the new hospital’s Neoclassical facade reflected the progressive optimism of its founders. Kavanaugh Hotel, “A Pictorial Map: Harrisonburg in the Heart of the Shenandoah Valley of Virginia,” ca. 1936. 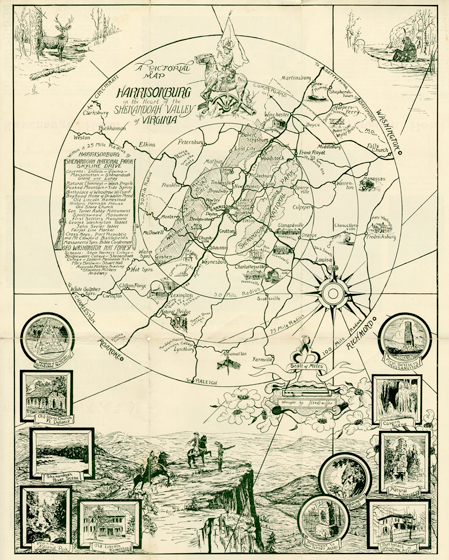 This map demonstrates the city’s desire to become a regional tourist destination during the 1930s. 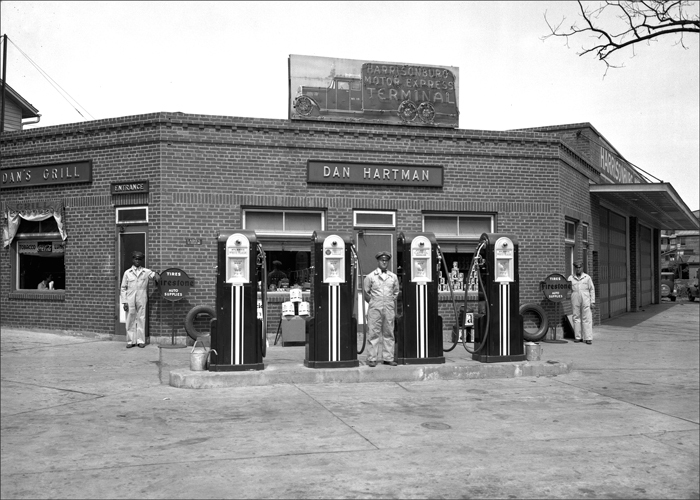 Photograph of Dan Hartman’s Service Station (ca. 1938) by Lupton Kaylor. A sizeable part of this local photographer’s business was promoting local businesses such as this “filling” station that also included a restaurant and motor freight company. The automobile age was fully embraced by Harrisonburg, which had become a well-known tourist destination by this time. 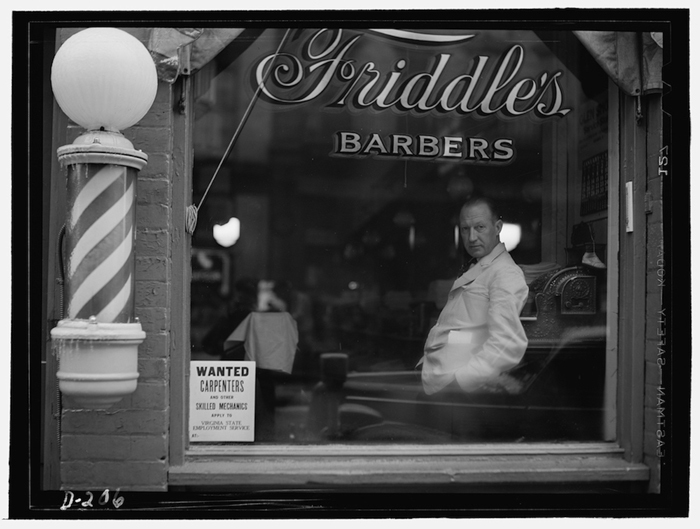 Photograph of Friddle’s Barbers at 80 South Main Street (1941) by John Vachon. This image, taken by a Farm Securities Administration photographer, not only depicts small-town America, but also promotes a New Deal federal employment program. Harrisonburg Redevelopment and Housing Authority, aerial view of Urban Renewal areas north of downtown, ca. 1965. Photographer unknown. 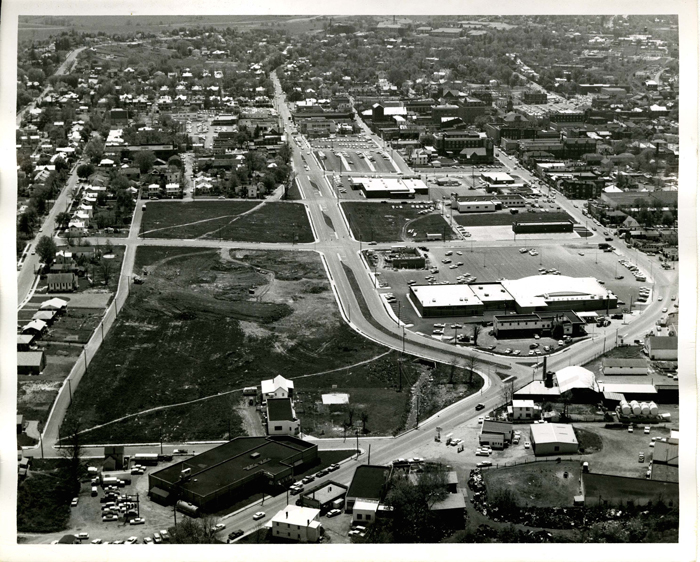 This photograph was taken by the city’s Redevelopment and Housing Authority to document the “progress” being made to encourage commercial development by widening arteries such as U.S. 11 (bottom and right) and North Mason Street (center) and leveling traditional working-class neighborhoods (lower left). 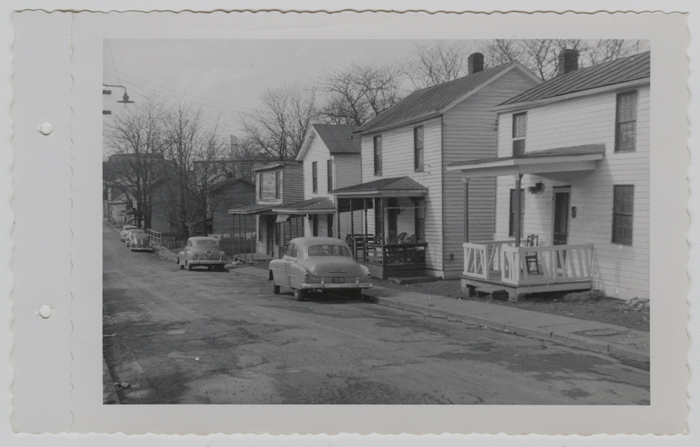 Harrisonburg Redevelopment and Housing Authority, 138 East Effinger Street, facing west, 1958. Photographer unknown. Compare this photograph with the next one, as they are the same location. Photograph of the same location as in the previous image, but now featuring the Rockingham County Administration, 2015. Photograph by David Ehrenpreis. 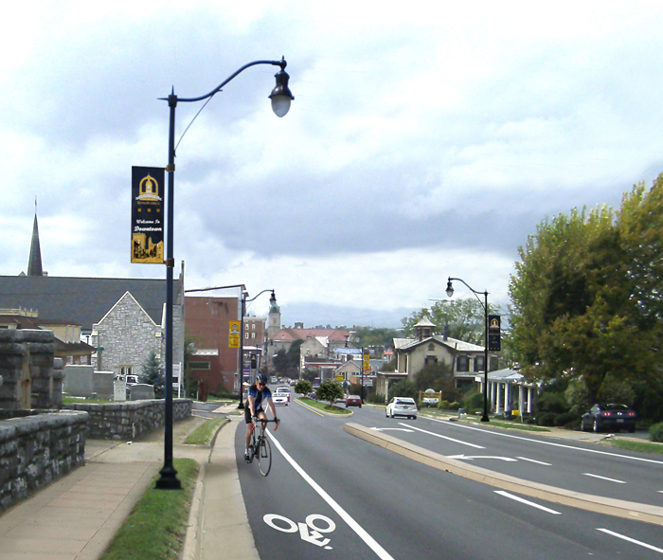 City of Harrisonburg’s digital rendering (2014) of an “improved” East Market Street (U.S. 11). 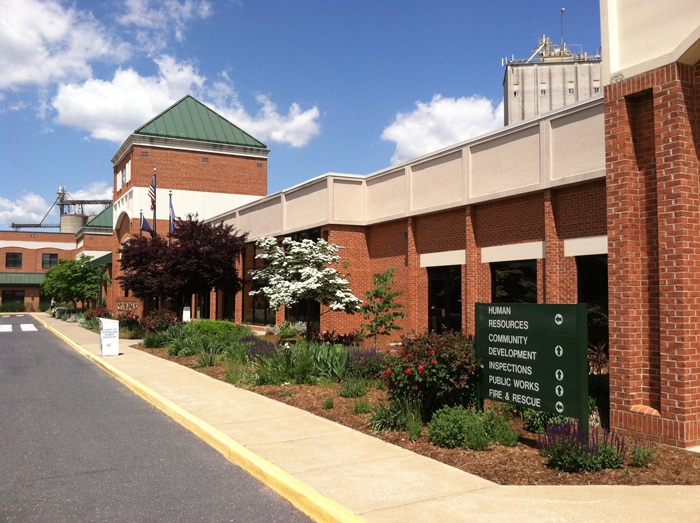 Harrisonburg has made great efforts to improve the city’s quality of life and, as part of this twenty-first- century vision, has become regionally known as a pedestrian-space and bike-friendly community for residents and visitors alike. 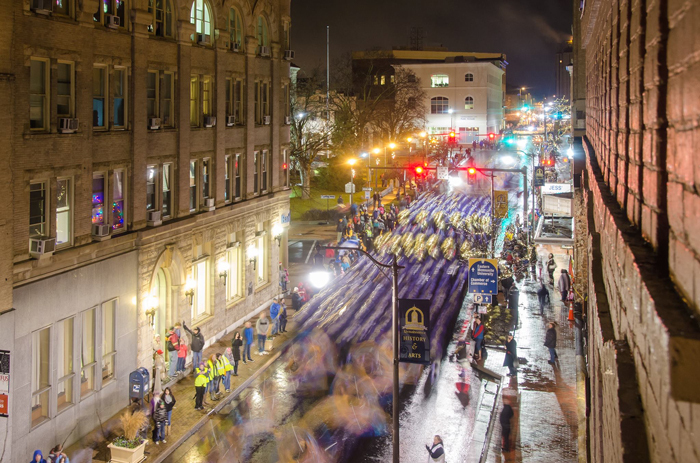 Bird’s-eye photograph (2014) by Art Pekum of a holiday parade on Main Street near Court Square. With the growing success of revitalization efforts, more residents and visitors are returning downtown. 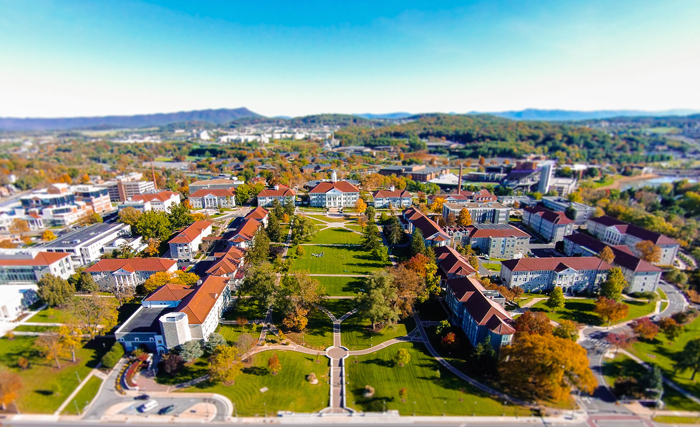 Aerial view of James Madison University, looking east, 2015. Photographer unknown. One of the city’s largest employers, J.M.U. started as a women’s teaching college in 1908. In recent decades, it has been regarded as one of the finest universities in Virginia and the region and now has more than 21,000 students and nearly 1,500 faculty.